Water is the essence of life and is key to maintaining good health. Sixty percent of your body weight comes from water, and it is a necessary chemical component to keep your bodily systems functioning properly. Water delivers nutrients to your cells, organs and tissues, keeps you hydrated and flushes toxins out of your body via sweat and urine. The amount of water a person needs will vary according to her individual needs, but there are some basic water consumption guidelines for women to follow. Although recommendations vary, they generally average the same amount of daily water requirements. Some health-care practitioners rely on the basic "8 x 8" rule of eight 8-ounce glasses of water every day. Others recommend you drink half of your body weight in ounces daily. For example, a 140 pound woman would drink 70 ounces of water. Preteen and teen girls generally have the same daily water requirements as adult women. Preteen and teen athletes, however, may need to increase their water intake to prevent dehydration. They can be especially susceptible to dehydration because of their lower body weight. Additionally, they may not be experienced enough to understand the warning signs of dehydration. Dehydration in sports occurs when physical activity causes fluids to be lost through sweating, and they are not replaced. Playing in hot weather conditions can accelerate the rate of fluid loss. Preteens and teens who participate in sports should make sure they replenish lost fluids with additional water consumption during and after physical activity. When you are pregnant, the demands placed on your body by your growing baby require an increased amount of daily fluids. The recommended eight glasses for non-pregnant women is the minimum a pregnant woman should consume, with an additional 8-ounce glass for every hour of light activity. Although milk and juices count toward your daily fluid intake, those drinks are generally high in calories, and you should try to avoid gaining weight above the recommended amount. Not drinking enough water can result in dehydration, which can lead to increased morning sickness and nausea in early pregnancy and to preterm labor in the second and third trimesters. Also, adequate amounts of water may decrease your risk of other pregnancy-related issues, such as constipation and bladder infections. Women who are going through menopause often experience a myriad of hormone-related symptoms. Although doctors do not generally recommend any additional water intake for menopausal women, basic guidelines for water consumption should be followed. Drinking the recommended eight or nine glasses of water each day may help to alleviate some of the symptoms associated with menopause, particularly hot flashes, night sweats, dry skin and bloating. Drinking a cool glass of water at the onset of a hot flash may decrease the severity of the episode (see reference 5). Keeping a glass of water on your nightstand allows you to drink water when you wake up with a hot flash or night sweats, which can immediately begin to cool down your body. 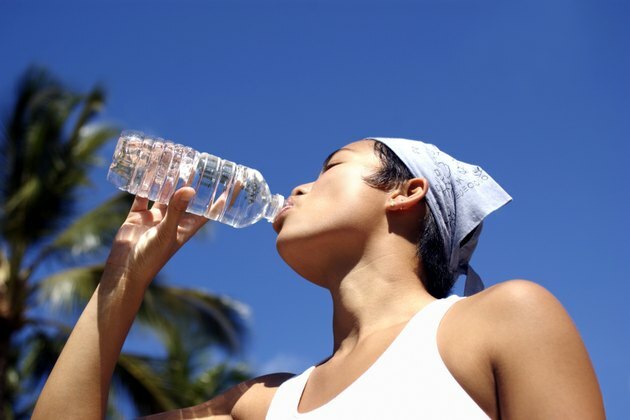 Staying hydrated can also help reduce hormone-related dry skin. How Much Water Do You Need to Drink to Avoid Dehydration?